Some kids just really know what they want. 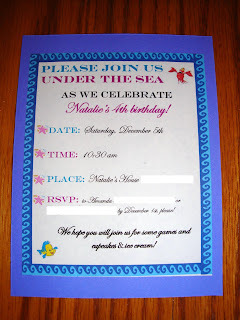 Months ago, Natalie told me that she wanted an "Ariel Under the Sea" party for her 4th birthday. Because my friend Tracy has 4 buckets of ocean decorations she'll let me borrow I wanted to be a fun mom, I agreed. I saw some Little Mermaid party invitations a few weeks ago, but I like to do things myself when I can. I knew that with some Joann's coupons, I could make the invites for less than it would take to buy them, and I'd use naptime to work. I thought that today I'd show you how I made the invites, which could easily be customized to fit a Christmas theme for upcoming children's holiday parties. I started in Microsoft Publisher, which is the program I use for documents if I need to use clip art. 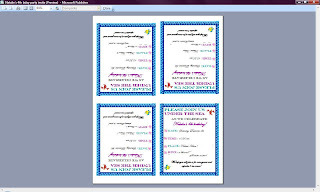 I believe Microsoft Word also has greeting card templates. I chose a standard greeting card template and deleted all of the existing wording and clip art. Then I added in my own "ocean wave" borders, wording, and clip art photos of Sebastian the crab and Flounder (found on Google). I liked using this template because it prints 4 to a page, which decreases the amount of ink and paper I'll have to use. You'll need 3 or 4 sheets of paper in coordinating patterns and colors. I chose blue and purple to go with colors I saw on The Little Mermaid DVD cover. You'll also need a pencil, ruler, glue stick, scissors, and/or a paper trimmer. I measured 12 purple squares small enough to fit inside the invitations envelopes (bought at Staples ages ago). Then I pulled out my coordinating paper, a lovely blue with glittery purple polka dots. I measured the patterned paper out to fit on top of the purple squares, leaving a border on each one. Here's the back after I glued the printed invite down. This sure saved me a sore hand from hand-writing a bunch of invitations! Before they were mailed, I added a few Little Mermaid-themed sea shell stickers. Months ago, I found a Disney Princess stamp set at JoAnn fabric that included an Ariel stamp. I used my 40% off coupon to make the price just right. I like acrylic stamps because they are versatile and easy to store. Most craft stores have lovely Christmas stamps out right now. I used good old Publisher to print a bunch of purple polka dot circles. Then I stamped an Ariel in the center of each one in black. I couldn't find my colored pencils, so I used some watercolor pencils. If naptime's end hadn't been quickly approaching, I might have played around with the watercolor. I know these will end up in most people's trash cans after a day or two, so I wasn't intent on creating any masterpieces. These could easily be embellished with ribbon, buttons, extra stickers, more glitter, you name it. Most craft stores (any other Virginians want to join me in campaigning for a Hobby Lobby??!) carry lovely paper packs with different Christmas themes. And to make sure each little girl knows for sure what the theme is, I sealed the envelopes with an Ariel sticker. Natalie commandeered the extras for her own private collection. Looking for more DIY inspiration? Visit Kimba at A Soft Place to Land for her weekly party. It's Day #23 of 27 Days of Thankful. Click the link to find out what's going on here every day in November until Thanksgiving Day. Only a few mores days to go until Thanksgiving! Today, I am thankful for 40% off coupons to craft stores (they make crafting so much easier!). Hi Amanda! Sorry I've been MIA for a while. 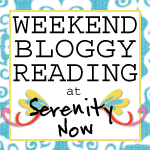 I'm trying to get back in the swing of things and was just getting caught up on your blog. So sorry to hear about the bad news at the pediatrician. I hope your daughter is doing alright? I'll certainly keep your family in my prayers! Here's a little something I'm thankful for- definitely gave me a good giggle, especially since my hubby is suffering (and not silently!) through a "mancold" right now. If you've never seen this video, it's sure to make you laugh! How cute! My daughter shares your love for Ariel and we had an Aril party last year! How much do you think these cost? 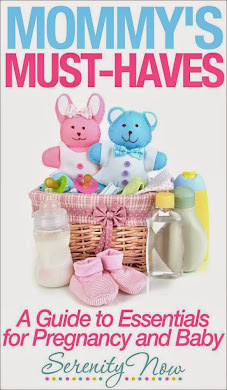 I bet it is hard to tell since you rpob had most of the stuff already. thanks momma! These are soooooo cute!!! The little mermaid was my absolute favorite movie when I was little. I was seriously obsessed, I had everything little mermaid. :-) And I'll join you in that Hobby Lobby campaign!!! Your invites turned out great! I can't believe you did those purple polka-dot circles with the computer, they look hand-stamped! So much easier though!! Your invites are cute but I sort of got lost when you said The Little Mermaid was one of your faves when you were a little girl. Okay, I swear I was an adult when that movie came out! No, I guess I was like 17 or 18. Still, sorry for the self-absorption here when I should be simply oooing and aahhing but now I feel old and craggly. Okay, I'm over it. 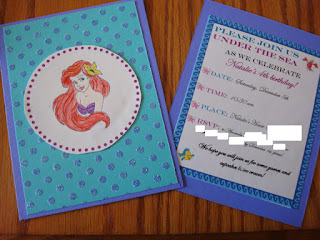 Your invites are adorable and I bet your little Ariel loved it all! They turned out PERFECT Amanda! I love making my own cards and invites...although I rarely do because I'm so unorganized that I run out of time! VERY cute! I used to make the invitations for all my kiddos birthday parties as well (long before blogging...LOL). Sadly, they have all outgrown that age for the most part. Look forward to pictures from the party!